Once THE !!! 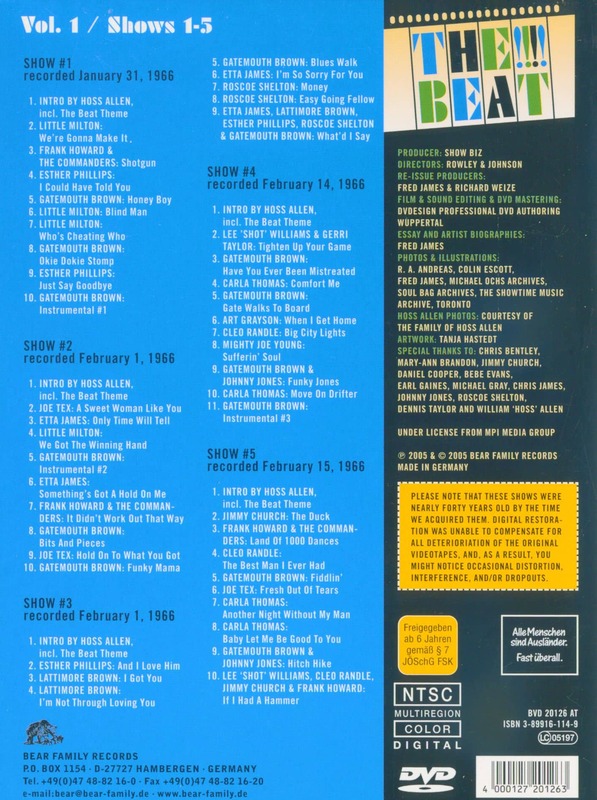 BEAT was only a legend. Fans and collectors heard that there was a television show in the mid-1960s that captured the absolute very best of the soul and R&B singers of the day. Some said it was made in Nashville and some said that it was made in Dallas. Musicians remembered working on the show and a few people remembered seeing it, but no one seemed to know what had happened to it. Did the tapes still exist? How many shows were there? Who exactly was on it? Now, nearly forty years later Bear Family answers all the questions. All the episodes still exist! It really was a fabulous show! It really was in color! It really did feature the absolute best of the soul and R&B acts of the day! And whereas once just fragments of the shows made their way onto bootlegs, now the entire series is available in first-generation quality. It has been a long time coming, but now THE !!! BEAT is back! "Various - The !!!! Beat"
Premier first generation quality, full color. Presenting the best names in soul and R&B. 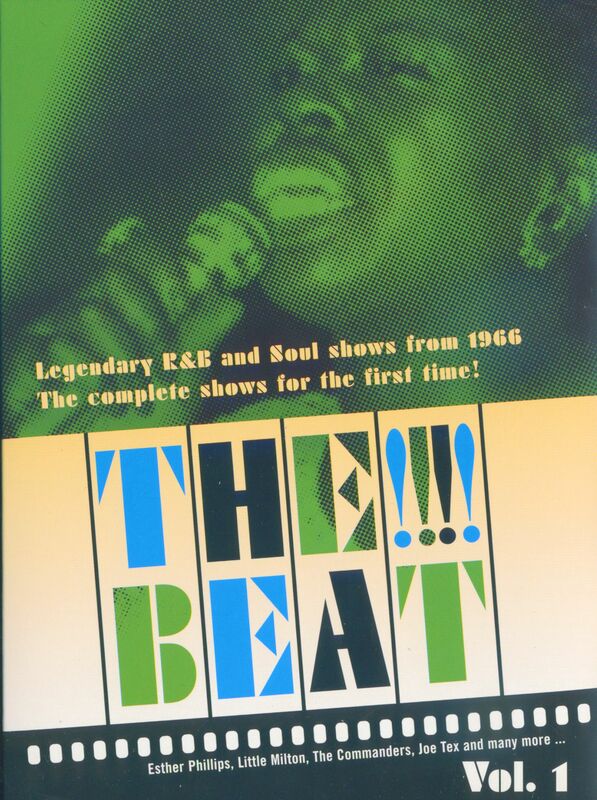 Legendary 1966 THE BEAT!!! !, US television show with live performances. A must-have series for the serious soul collector. Soul music is bigger than ever now, just as the original practitioners are dying off or performing way past their prime. Revivalists like Joss Stone often only emphasize how great the originals were in their day, so here is a reminder of what REAL soul music was like from the absolute original masters. There were 26 THE !!! 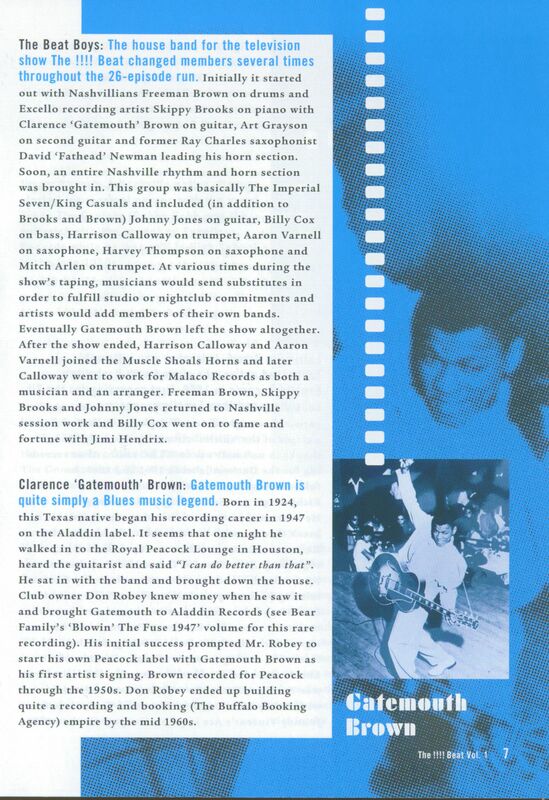 BEAT shows, and many of the performances were live in the studio with a backup band led by the terrific Clarence 'Gatemouth' Brown. Here are just a few of the original soul and R&B stars captured in their prime: Otis Redding; Little Milton, Esther Phillips, Joe Tex, Etta James, Lattimore Brown, Rosco Shelton, Carla Thomas, Freddie King, Barbara Lynn, Johnny Taylor, Maurice & The Radiants, Louis Jordan, Mighty Hannibal, Clarence ‘Frogman’ Henry, Robert Parker, Joe Simon, Mitty Collier, Jamo Thomas, Zz Hill, Lou Rawls, Bobby Hebb, Willie Mitchell, Don Bryant, Ovations, Bar-Kays, Percy Sledge, Garnett Mimms, and Sam & Dave. When you’re talking about soul music, it truly comes no better than this! Fans in the UK can expect a treat in 2005 in the shape of a multi-part series on SOUL MUSIC, so SOUL is officially back. Go get every episode of the THE !!! BEAT. Exclusively from Bear Family….the new Soul City! 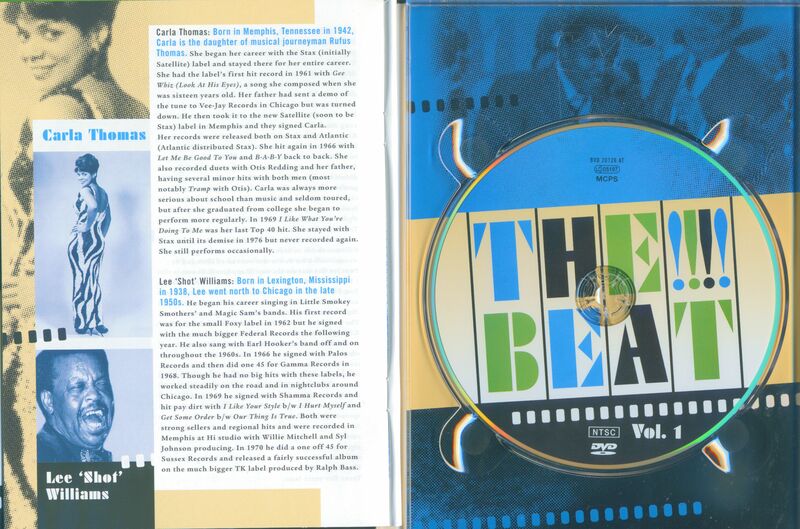 Customer evaluation for "Vol.1, (DVD) Legendary R&B and Soul Shows from 1966"